The Golden Gate Bridge opened in San Francisco. Comedian Bill Cosby was born. And in 1937, SPAM® products were introduced as a meal staple into American cupboards. To help celebrate 75 years of the SPAM® brand, the makers of SPAM® products are launching its first ever campaign spokescharacter, Sir Can A-Lot™ – a two and a half inch tall embodiment of the brand essence ready to begin a crusade to rescue the world from routine meals. He promises to approach his mission with equal parts motivation and mischief, taking consumers by surprise in their most uninspired moments. He will appear throughout the 75th anniversary campaign in television and online ads, and the Sir Can-A-Lot™ Spokescharacter will also serve as the guide for the redesigned http://www.SPAM.com which invites users to scroll up instead of down to experience engaging brand content and to broaden their horizons of traditional Web exploration. 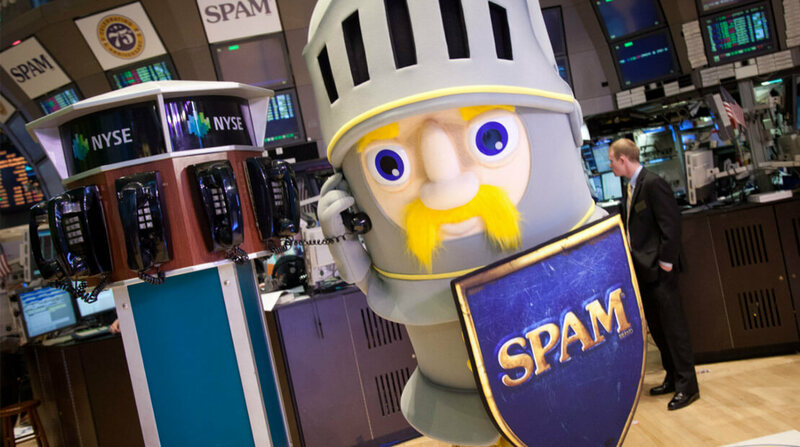 –Television spots: Three, 30-second, animated television advertisements feature our Sir Can-A-Lot™ Spokescharacter introducing SPAM® products into ho-hum meals in surprising ways – such as catapulting SPAM® products into a potato casserole or hiding in an egg carton. Each spot also condenses into a shorter, 15 second version. –Online banner ads: Online banner advertisements depict our lovable Sir Can-A-Lot™ Spokescharacter proudly showcasing his love for glorious SPAM® products, using affectionate nicknames for his inspiring dishes, such as “TaTerrific” to describe potatoes and SPAM® Classic, “MacNificent” for SPAM® Mac ‘n Cheese and “EggCellent” to describe SPAM® and eggs. Users will also be introduced to our Sir Can-A-Lot™ Spokescharacter in a 15 second spot online. -The Glorious SPAM® Tower provides the ability to explore the unlimited heights of our Sir Can-a-Lot™ Spokescharacter’s world, encouraging interaction by allowing fans to contribute content to the growing tower made up of cans. Within each can, fans uncover new product varieties, read news and interact with the brand’s Facebook and Twitter conversations. Enhanced Recipe Features: An entirely new set of comprehensive recipe options is unveiled, including glorious SPAM® recipe descriptions, user-friendly images and a variety of options to accommodate any recipe box. –Fun & Games: Users are immersed in the world of our Sir Can-A-Lot™ Spokescharacter that invites them to explore the SPAM® brand with a curated collection of the best SPAM® brand content in the world. Creation of the TV and online advertisements was managed by BBDO Minneapolis. TV ads were produced by Laika House. Website and design was created by Proximity Minneapolis, with Proof Integrated Communications managing Web development. In addition to the new campaign, the month of July will contain important milestones as the brand recognizes its 75th birthday on July 5. Hormel Foods will honor the community and home of the SPAM® brand in Austin, MN with a late-month festival full of entertainment and history. The brand will also bring the Sir Can-A-Lot™ Spokescharacter to New York to participate in the honor of ringing the closing bell at the New York Stock Exchange. For more information, please visit http://www.spam.com or join the conversation on Facebook https://www.facebook.com/spambrand or Twitter https://twitter.com/#!/SPAMbrand. The Ads of SPAM Dan Goldman reveals how SPAM has stayed relevant through the decades.